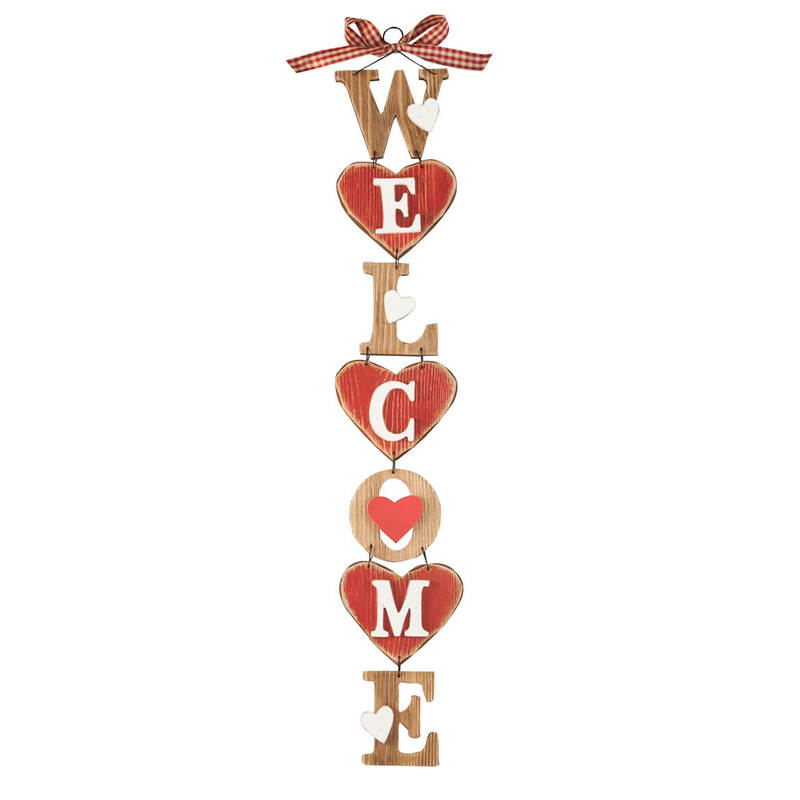 Lending a warm, heartfelt welcome on Valentine’s Day or any day, this decorative Valentine’s Day welcome sign boasts all the charm of a handmade treasure. Artfully crafted of wood and wire with laser-cut letters and charming hearts, it’s topped with a red-and-white gingham ribbon bow for added fun. A sweet touch for your covered doorway or entryway, it’s perfect for apartment or interior condo doors—offering festive style in February or expressing your hospitality all year long! Outdoor welcome sign designed for indoor/protected outdoor use; includes hanging loop. 25″ long x 4 1/4″ wide. 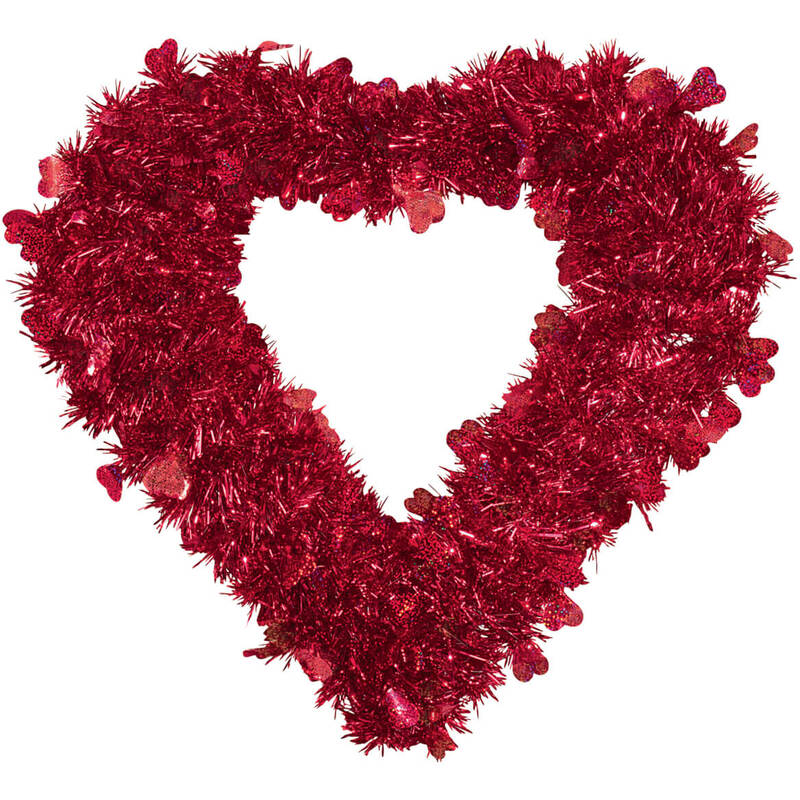 This dazzling Valentine heart wreath decoration brightens the season, lending festive charm to any doorway or wall. Our heart shaped wreath is adorned with white and red Valentines and comes in assorted red and white styles; we’ll choose for you. Each Valentine’s day heart wreath is made of PVC and steel wire; for indoor or protected outdoor use. Wreath measures 15 3/4″ diameter. You gotta love this BIG, red heart … and at 19″ x 19″, it’s big enough to make the whole neighborhood swoon on Valentine’s Day! Fun, cute and weather-resistant, Valentines Day heart features a hole in back for hanging or staking in the ground (stake not included). 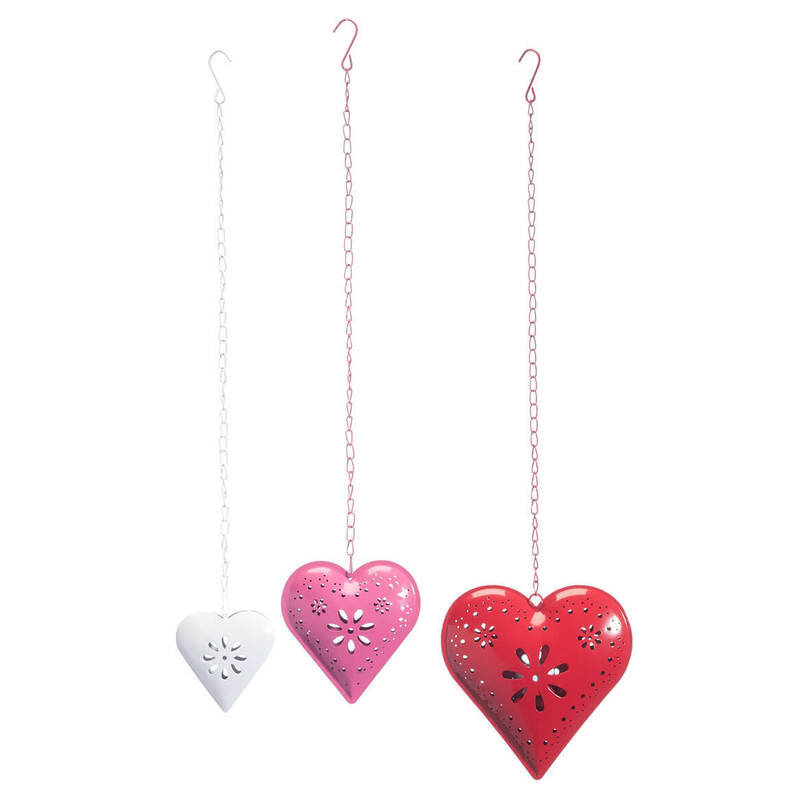 Sweet for Valentine’s Day or any day, these pretty metal hanging hearts offer endless options for decorative display. Each heart is crafted of durable 100% metal, suspended on a metal chain with a hook at the end for easy hanging, indoors or out. The large red metal heart opens up to a tea light holder inside, and features latch to keep it securely closed while soft candle light shines through its intricate cut-out patterns (tea light not included). Set of 3 hanging heart decorations includes; red (26″ long from hook to bottom of heart; approx. 7″ wide); pink (24 1/2″ long from hook to bottom of heart; approx. 5″ wide); white 24″ long from hook to bottom of heart, approx. 3 3/4″ wide). Pink and white hearts do not open. Give the gift of love and romance with a Personalized LOVE Acrylic Heart Keepsake. This customized gift can be personalized with any custom message line, up to 20 characters. LOVE is static. 3 3/4″long x 4 1/8″high x 3/4″wide. 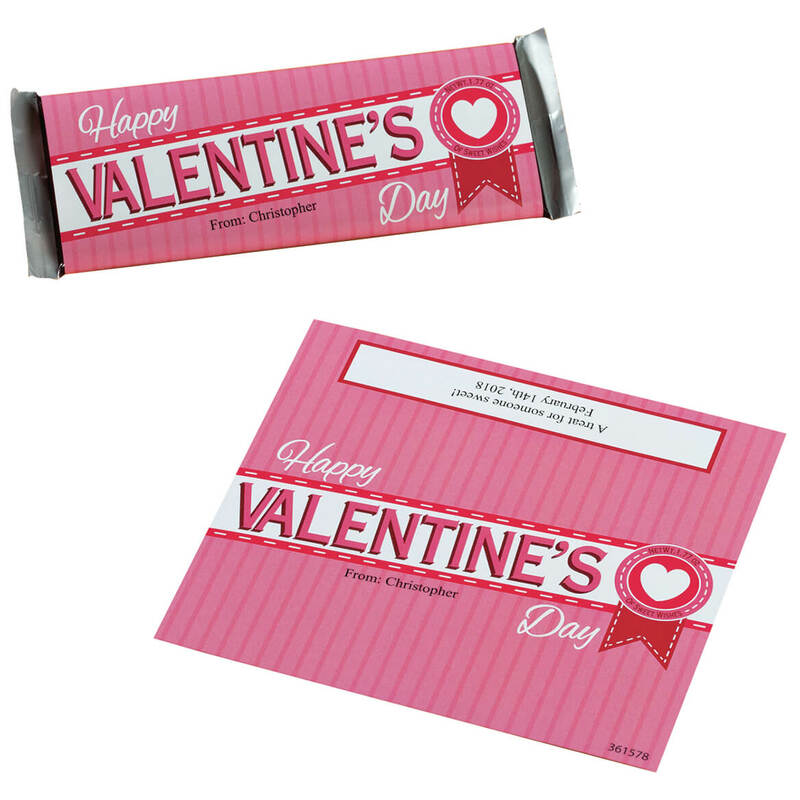 The only thing better than chocolate for Valentine’s Day is when it comes in these personalized candy bar wrappers! Wishing “Happy Valentine’s Day” in front, the candy bar wrappers provide two places to sweeten the treat with a personalized touch. We’ll add 1 short personalized message in front (From: is not standard) and 2 longer lines in back, expressing your sentiments. Specify message in front; limit 1 line, 18 letters/spaces. Specify message in back; limit 2 lines, 40 letter/spaces per line. The beautifully detailed paper wrappers fit standard size candy bars and easily fold together for quick assembly. Set of 24. Each custom candy wrapper is 5 1/2″ long x 5″ wide. Candy bar not included. 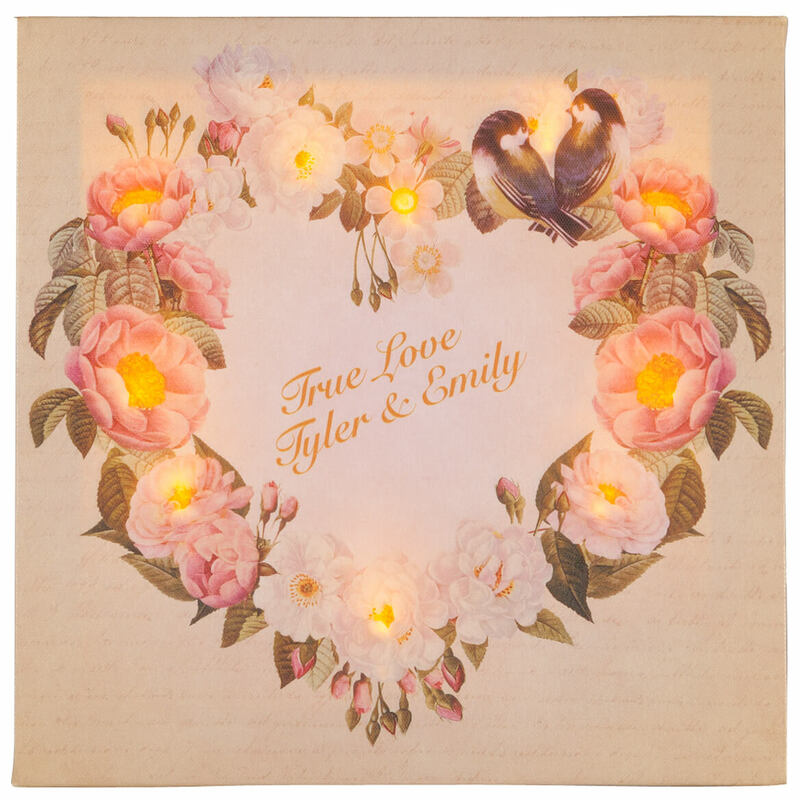 Sparkling with LED lights, this personalized Valentine’s Day Floral Wreath lighted canvas blooms with sweet sentiment when custom-made for two lucky lovebirds! We’ve built storybook romance right into our gallery-wrapped wall canvas, creating a Valentine or wedding gift to cherish forever. Cord-free for easy display, the lighted canvas uses 2 AA batteries (not included). Personalize with your message and/or names (“True Love” is not pre-printed). Specify 2 lines; limit 15 letters/spaces each. Includes side on/off switch and metal sawtooth hanging hook. 11″ long x 11″ wide. 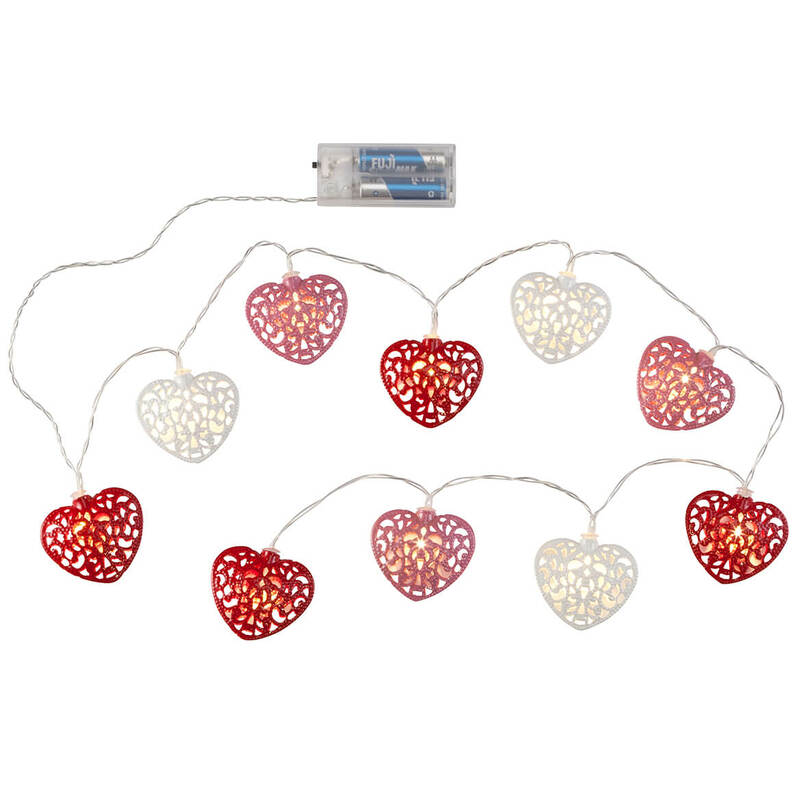 For soft, glowing romance on Valentine’s Day or any day, switch on these sweet metal heart string lights and enjoy the fun! Twinkling with classic charm for Valentine’s Day parties, birthdays, anniversaries, wedding showers and more, the 47″ long LED lights includes 10 metal hearts with lace-style cutouts in red, white and pink. Each heart glows with a long-lasting white LED bulb. Designed for indoor/protected outdoor use, the party-ready LED string lights can be displayed along stair railings, draped around windows or strung from chandeliers, and are fun for apartment or condo interior doorways and covered entryways. No outlet needed; the metal heart string lights operate on 2 AA batteries (not included) and feature on on/off switch. Set of 10 battery-operated lights. Each heart light approx. 2 1/4″ wide x 2″ high. 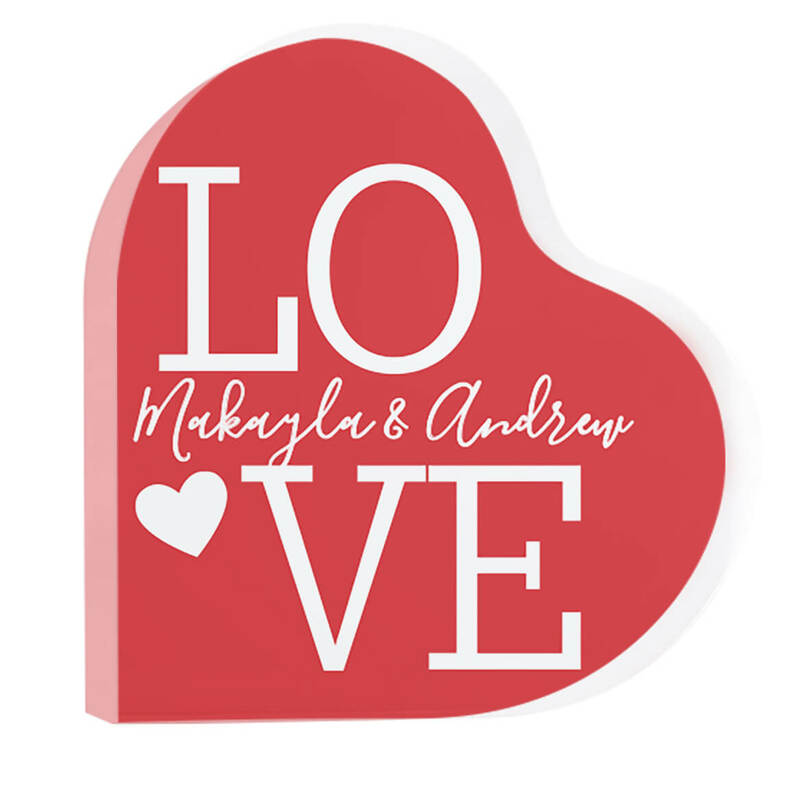 This personalized wooden heart plaque adds unique, one-of-a-kind charm to any home’s décor—especially when personalized for one loving family. 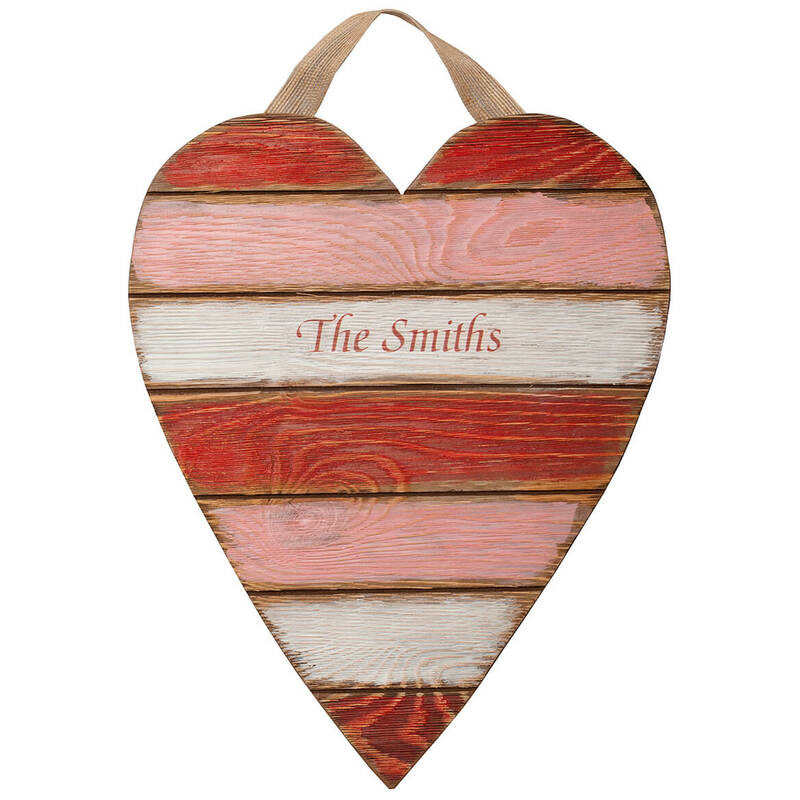 Complete with a cute burlap hanging ribbon for easy display, the heart-shaped wooden sign features artful, distressed detailing and color washed planks of red, pink and white. We’ll personalize this heart wall hanging with any family name or message, creating a thoughtful gift and custom home accent for Valentine’s Day or any day. Specify name; limit 1 line, 18 letters/spaces. Designed for indoor/protected outdoor use. 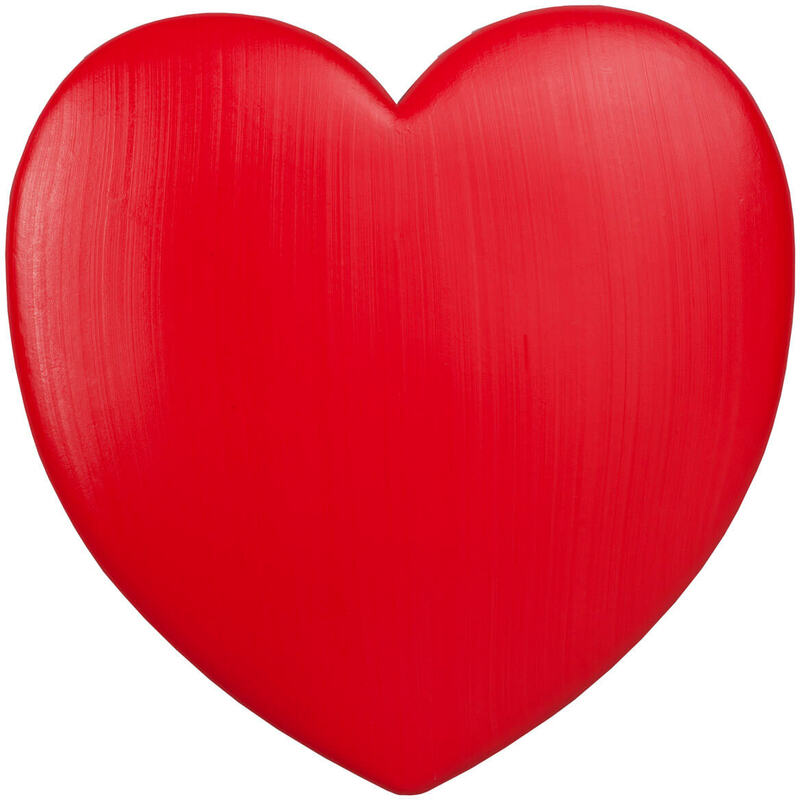 Wooden heart measures 12 3/8″ wide x 15 3/4″ high; hangs 18″ long with hanging ribbon.